In Part 1 of my reflection on the 2014 Hawaii Google Summit by +EdTechTeam, I shared my personal goal and the journey I took from last year's summit until today. 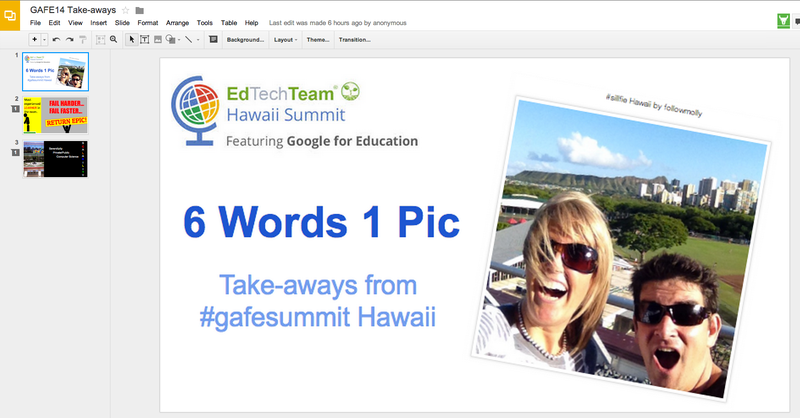 In Part 2 I'll share my experiences, take-aways, and session resources from the 2014 Hawaii Google Summit. The biggest revelation for me at this Summit was the power of Google Maps and Google Earth. Like most of us, I'm sure, I've used Google Maps to look up directions, and yes, I've used Google Earth to check out my house! But after listening to +Evan Rapoport, Product Manager for Google Maps, talk at the opening Keynote, and participating in +John Bailey and +Emily Henderson's session (Getting Going with Google Geo Tools), I was inspired to find new and better ways to bring the world within reach for the students of Hawaii! Evan also touched on the idea of moonshot thinking and helping our students to prepare for a world in which they can find new ways to contribute and improve our lives and of those around us. After listening to Evan speak, I'm excited at the thought of self driving cars in the near future! For my first session, I attended +Jim Sill's Youtube in the Classroom. I learned how powerful Youtube can be for the flipped classroom, especially with the use of customized playlists with the ability to adjust start and end times for videos, insert information, and record straight from your webcam into a playlist. Creating a playlist of essential learning videos for students before, during, or after a lesson is a great way to incorporate Youtube in the classroom. Jim also highlighted a wonderful Chrome Extension called Youtube Options for Chrome which will take away all the surrounding ads, comments, and suggested videos for you and your students. The next session I attended was Organized Chaos: Incorporating Google Sites into Your School and Classroom by Marc Marquez and +Erin Sakamoto. They highlighted how useful a fully integrated Google Site for faculty and staff can be in a school. I've heard this called a Teacher Portal. For Google Apps schools, a Teacher Portal is a great way to easily dispense information, documents, resources, and calendars. The portal can be locked down so that only staff members have access (through the use of contact groups), in turn preventing the general public and students from gaining access. Google Sites makes it very easy to incorporate Google Calendars (i.e. athletic schedules, faculty meetings, school activities, etc.). Essential school documents like leave forms, field trips forms, etc. can be uploaded to Google Drive and shared or linked through the Site. At my school, I've helped design a similar Teacher Portal with Google Sites this school year, and it has been very successful with my faculty and staff. Take the idea of a Teacher Portal a step further and find a way to use the same concept in the classroom in the form of a Student or Class Portal. +Erin Sakamoto demonstrated this with the Google Sites she has created for each of her classes. Each site contains homework and classwork information, important reminders and dates, and access to worksheets and documents. Now the student and the family can't complain that the information was never shared! The tool that impressed me the most from this list is the Tour Builder (currently in beta). The Google Tour Builder allows users to create their own narrated tours around the Earth, with the help of Google Earth. You pick the locations, adjust the 3D Earth view, and can insert text, pictures, and videos to support your tour. There are many more options like customized pins, editable text, and the ability to include dates and times. Think about the possibilities this brings to a class, especially a flipped classroom! Teachers can create Tours to support student learning, and students can create Tours to demonstrate their learning! And because this is still in beta, I hope to see many more options added! I found +Jim Sill's Keynote to be very inspirational and I hope that it was eye opening for many educators. He talked about the power of Youtube and Social Media. As a nation, we are far too quick to lock something down that we have no idea about. We fear what we can not control. But to ignore what social media might be able to do for education is a great disservice to our children. Rather than fear it, embrace it. Find ways to use it effectively and to teach our children how to be safe. Social Media in education is both an opportunity and an obligation for teachers. Our students are already using it in many ways. Do we just ignore it and pretend it doesn't exist? I'm also very excited to learn more about +Brendan Brennan and +Hye Jung Kim's Project Open Glassroom. When Google Glass was first announced, I instantly knew that this would change the world and that we had a unique opportunity to connect classrooms with the world around us. Brendan summed it up quite nicely by saying, "we have an opportunity to see learning through the eyes of a child." How amazing is that?! +Linda Lindsay led a great session on the Chrome Browser and gave some great tips and tricks on how to use Chrome effectively. Here is her session presentation. One of the best tips she shared was how to customize the search options in the Omnibox! I had no idea this was possible! There are so many things you can do with Chrome that I didn't even realize. I also appreciated Linda's session because we had time in the end to share with each other. 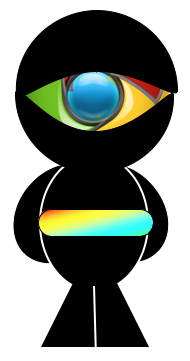 Several participants shared some of their favorite Chrome extensions and apps. One new extension that I learned about and have started using quite frequently now is Extensions Manager, which allows the user to easily toggle extensions and apps on and off right from the extensions bar. Very useful! I attended another session by +Evan Rapoport, +John Bailey, and +Emily Henderson that focused on even more Google Geo tools! In this session, the discussion was more about how the public can contribute to Google Earth and Maps with services and apps like Project PhotoSphere, the Theta Ricoh device that takes a 360 degree image with the click of a button, and Panoramio, a place for Google users to submit images to Google Maps and Google Earth. We had another great keynote presentation, this time by +Molly Schroeder! She introduced the audience to the idea of moonshot thinking and living in beta. The concept of living in beta was new to me and I enjoyed Molly's explanation that living in beta is when "we allow students to participate in a process of learning, where failure is an expectation." I've always felt that failure is an integral part of life and it's an important part of the learning process. It reminds me of a famous quote by Thomas Edison on failure, "I have not failed. I've just found 10,000 ways that won't work." I love that quote, because it reflects a strong belief that in order to learn and be successful, we must fail first and fail often. I mentioned back in Part 1 of my Google Summit blog post that my goal was to present at this year's Summit, and I did! I presented two sessions! One of them I present on my own, Creating & Maintaining an Automated Online Help Desk w/ GAFE, and the other I presented with my coworker, +Elisabeth Yuen. Liz and I created a series of workshop modules to teach educators how to effectively use Google Apps in the classroom. We presented our GAFE Dojo - Drive Workshop. I have passion for presenting and I thoroughly enjoyed it! There are several opportunities for Educators to continue the learning and to connect with others and build upon their PLN (Professional Learning Network). +Michelle Carlson Colte recently invited Hawaii Google Summit participants to collaborate on a presentation project and share their experiences and moonshots. Visit her blog, http://edmoonshot.blogspot.com/ and contribute your "take-aways" to the GAFE14 Take-Aways Presentation! The EdTech Mixed Plate LIVE Google+ Hangout is dedicating 2 episodes to the Hawaii Google Summit to share as much as we can from the summit! Episode 15 aired on March 23rd and Episode 16 will air on March 30th. +Linda Lindsay also hosts a LIVE Google+ Hangout called Google Rocks! Hawaii and she recently had an episode dedicated to the Hawaii Google Summit. 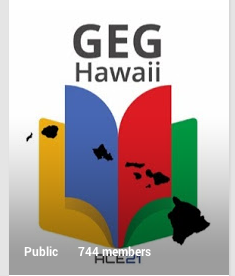 Hawaii also has its own GEG (Google Educators Group) that is now 744 members strong! Join the GEG Hawaii ACE21 Google+ Community and share in the GAFE discussions! Also join the Google in Edu Summits by EdTechTeam Google+ Community!